Our nice new heating trenches are looking very smart! They have been pressure testing the pipework and there was clearly a big hole. It was traced down to a section of the old pipework just by the tower, one of the few old pipes which is being reused. It turned out to have an unknown spur that supplied a heating coil under the stonework, and it had come loose. That then solved a big mystery as to why one little section of floor was always wet! A stone was lifted and the pipe is being sealed. Under the stone was newspaper from 1976 used for packing! The west tower door hinges which are probably the originals, a mere 500 years old, have been repaired and the doors now hang well. Sadly they are not quite as draft proofed as new doors! The mat well is today being completed. 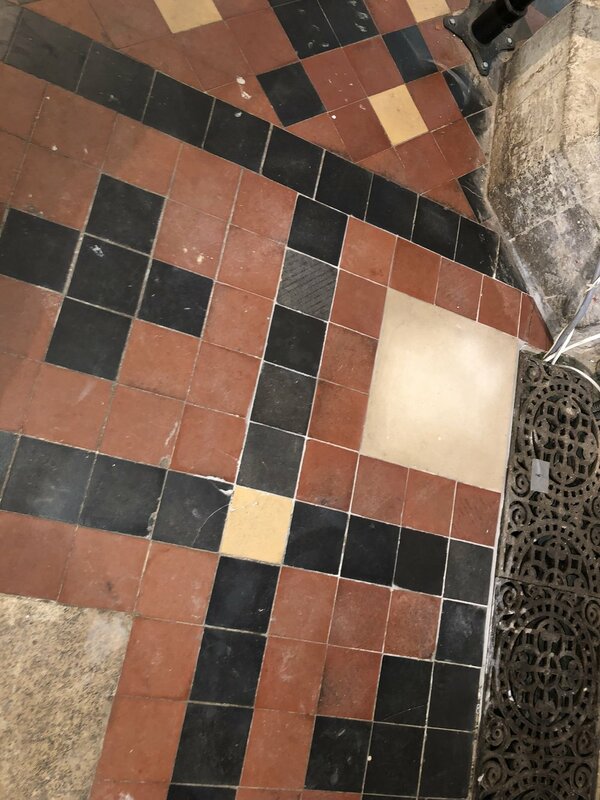 Where they have taken up the floor the old Victorian tiles are being relaid. The project is still on course for commissioning during Holy Week and hand over after Easter. We expect to be back in the church for the beginning of June, but please hold that lightly for now.